Blue arrow d is bullet path, perpendicular to LOS. Coyote brown arrow d' is vertical drop. 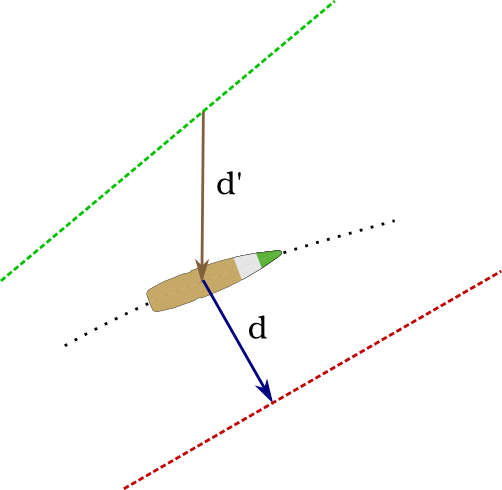 In absence of gravity, the bullet would continue along bore axis and drop would remain zero. On Earth drop is zero at the muzzle and negative throughout the rest of trajectory -- that is, below the bore axis. Bullet path, on the other hand, can be either positive or negative (above or below the LOS). To calculate drop table in JBM, set sight height to 0 and zero distance to 1 m.
Shooting rules of thumb should work under stress. Sierra method is too complex to be of much use in such scenario. Even setting aside practicality of two sets of tables, the chance of getting the calculation wrong or not fast enough is too high. So none of the methods so far is acceptable. It does not appear possible to have your cake and eat it, too. Yet there is light at the end of the tunnel. Read on.